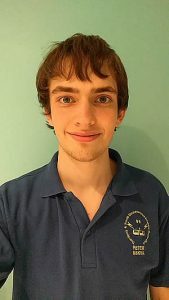 A promising engineer is representing the UK and making contact with the International Space Station at a major youth event in London this week. Former Monmouth School pupil Peter is among three young UK radio amateurs at YOTA 2017 (Youngsters on the Air). The 19-year-old, who finished his A levels at Monmouth this summer, is among 80 young people from 26 countries at the camp, which is being hosted by the Radio Society of Great Britain (RSGB). The youngsters will take part in fun and challenging amateur radio activities with visits to Bletchley Park and the National Radio Centre, Ofcom’s Spectrum Management Centre in Baldock and the London Science Museum. They will also have the opportunity to use amateur radio to speak directly to astronaut Paulo Nespoli, IZ0JPA on the International Space Station (ISS) and see him via live video by Amateur TV. Peter has a strong interest in electronics and engineering and joined an amateur radio club in Thornbury, where he lives, three years ago. He hopes to read engineering at Swansea University and has aspirations to work in avionics, an electronic systems used on aircraft, artificial satellites, and spacecraft. He secured a full licence with RSGB after taking a six-month course and sitting a two-hour examination. Peter took the UK’s advanced amateur radio qualification online and impressed his tutor Steve Hartley, a RSGB board director and YOTA project manager. “I am mostly interested in electronics and engineering and very excited to be working with 80 young people, aged 18 to 25, from most countries in Europe,” said Peter. Peter was a day pupil at Monmouth School and spent a third year in the Sixth Form due to illness. “I had spare time in my final year at the school because I was doing two-and-a-half A levels, so I got heavily involved in design and technology,” said Peter, a Radio Society of Great Britain member. “The school have been very supportive and I did lots of 3D printing and just helped out around the department where I could. “I have learned a huge amount from my time with the radio club and at Monmouth School,” he said. Mr Hartley, who recognised Peter’s talent and accepted him for the annual project, says clubs across the country, supported by the RSGB regional team, will host local events this week to allow as many young people as possible to try amateur radio. He said: “Amateur radio is a popular technical hobby which has many links to the STEM (science, technology, engineering and maths) curriculum.